Catch and Release... and Live! Bonefish can often be exhausted when landed. In this state, after being released, they often fall prey to aggressive sharks or 'cudas who sense an opportunity for a "free lunch". 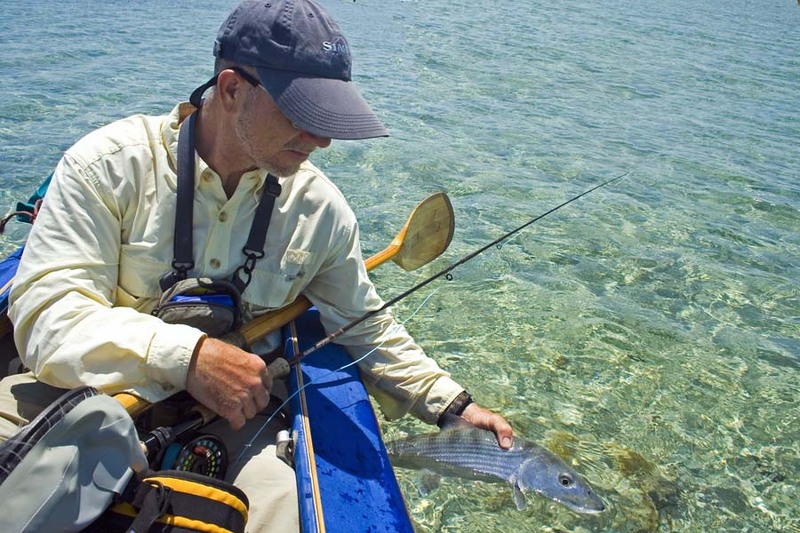 If you want to give the next bonefish you release a better chance, hold your fish in the water near the bottom. With two fingers simply rub the top of his skull with three inch strokes back and forth. The bonefish will "freeze" and appear hypnotized. In the meantime, he will continue to pump life-giving water through his gills. In a few moments, much of the paralyzing lactic acid that had collected in his muscles from the fight will be dissipated. You can continue this stroking until the fish regains his strength. When you stop rubbing his head, he will slowly "come back", then swim off, perhaps a bit wiser for the adventure. Try it... but be sure to look around first for 'cudas and sharks on the prowl. I recently submitted a photo-essay for This is Fly magazine on bonefishing in the Bahamas in the 1980's. A number of readers of this blog read that photo-essay and they made a request. They had remembered reading a trip report I had published in our newsletter on an amazing day on South Andros. They asked me to post that trip report. I wasn't sure I could find it, but I did, so here goes! We knew it had to be there. 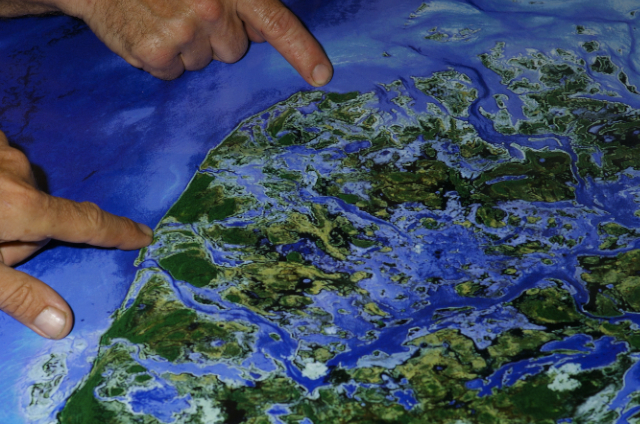 The maps showed a creek system, but all we could see was the rich green of mangroves stretching to the horizon. I had spent the previous day fishing a lake system that I had discovered after following a small creek into the island's interior. The creek had "opened up" into a dreamscape that included a few tailing bones, but I had not been able to link it up to the larger creek system promised by our now wrinkled and beer-stained map. The new dawn had brought us to where we thought the creek system came closest to the outside. Bahamian maps are notoriously inaccurate, but unfailing optimism dogs me and my friend like cheap cologne, so here we stood staring out into the mangroves while at the same time, ignoring the prolific bonefish flats of South Andros Island that were now behind us. All drugged up on hope and the promise of adventure, we stepped forward having decided to follow our instincts and at least give it a good try. We left the perfect turquoise waters of the bay and slogged into a sticky marl that was recently uncovered by the swiftly departing tide. This sucking, stinking, gooey muck eventually gave way to a thick mangrove maze. Like drunk sailors, we stumbled while weaving around each individual bush. I licked my salty lip while heaving heavy and scratched legs over hundreds of grabby mangrove roots. It was tough, hot work and soon our resolve was tested. My friend and I had embarked on many such adventures and in our thirty years of friendship, we had done our fair share of quirky, some may say idiotic, journeys. "Whadja think?" I sputtered, spewing sweat that had dripped from my upper lip into my mouth. "Let's give it ten more minutes". Chuck exhaled. We just laughed at each other and pressed on. This conversation was just ritual. We knew we would not turn back until we either were exhausted or had found the creek. So like always, we pressed on. As sweat soaked through our shirts and dribbled into our eyes, the mud and mangroves gave way to firmer ground and soon we were climbing onto ancient coral outcroppings. We jumped from honeycombed ridges to teetering limestone plates. Some steps would bring a balanced plate slamming down against the underlying ridge with a deep chiming sound. After a few minutes, we reached a small hill that was covered in saw palmetto and scrub brush. We climbed the bump to get a better view and hopefully see the creek. The vegetation was too dense to see much so we just continued in the direction we thought best. From the top of another teetering coral plate, we could just make out two man-of-war bushes separated by a thin sliver of pale yellow sand. Creek or dry pan, we couldn't tell. At this point, we had invested too much time to entertain any thoughts of turning back. The allure of an unexplored and unfished creek was just too great. So like always, we pushed on. The rock and saw palmetto promptly gave way to a pan that was baked to a dry crust on top, but, as our footprints revealed, was damp and mucky underneath. We slogged on until we could just make out a small creek at the base of the two man-of-war bushes. Beyond the bushes, a small bay opened up and beyond the bay, a glistening flat stretched out for at least a mile. Two lemon sharks were weaving in and out of the bushes. Three scarlet ibis and a trio of grey herons were foraging too. Birds meant fish and sharks meant these waters were connected somehow to the ocean. This was good news! Gooey with sweat and sunscreen and tired to the bone, we decided to take a break and get a sip of water. As we dug into packs to find our tepid water bottles, a tail popped up between the two small sharks. We looked at each other and smiled. "OK then." I said, trying my best to be cool. "So I guess now we have to walk all the way to the water." Apparently our eyes had to adjust to the shimmering heat or we were in the midst of a full-fledged hallucination because by the time we looked back at the small bay, we could see nervous water everywhere. We stood transfixed, while small V's cordoned the flat and perky tails waved at us. There were dozens of bonefish here. They were scuttling about in very shallow water. Their backs were barely covered. We unhooked flies from guides and stripped line off reels as we raced to the water's edge. Our thirst and fatigue was now forgotten. What followed was not elegant or classic. It was simple revenge. Revenge for all the bonefish that had spanked us over the years. Revenge for all those fish that could not be found and revenge for all those fish that we did find and couldn't catch. Revenge for all those nervous Nellies that had blown up at the slightest noise and for all those wise old monsters who had snubbed us and left us muttering under our breaths. And our revenge on this day was sweet. On almost every cast we hooked a fish. They were everywhere and they were very stupid. They, at times, fought each other to get to our flies. They ate everything we tossed at them. It didn't take long for revenge to give way to gluttony especially when these cute little creatures performed tricks or entertained us with their antics. Some fish scuttled into impossibly shallow water to chase a fly, while others would return time after time to pick up a fly that had pulled from their apparently, not too tender jaws. It was as if all the bonefish had gotten together and decided to teach us a lesson. It took us a while to learn the lesson and, if any bonefish are listening, I would be happy to relearn this lesson again. "The lesson" basically is this: Bonefishing is so great precisely because it is usually so hard. If it becomes too easy, most anglers will try and make it hard once again. I know this because after railing on fish after fish, we eventually left these sure bets to wade out further into the bay and eventually follow the shoreline deeper into the island's interior. We found fish everywhere and with the relaxed attitude that only success can bring, caught a lot more of them. But with revenge long gone and our gluttony not far behind, we were now more tourists than anglers. We sauntered along taking in all the sights. At one point, we found a lake that had a very narrow and now, very dry entrance. The lake was landlocked and probably had been since the last full moon. Inside this lake were dozens of 7-9 lb. bonefish. Apparently, the pickings were good. Here, they could dine in complete safety. Only the next spring tide would open the entrance one again. Only then could they have the choice to leave the lake or stay until the next spring tide. The next really big high tide occurred in the middle of the night on the next new moon.... some eight days from now. I took a moment to imagine these monsters slinking out of the lake under the cloak of a coal black night. I imagined them following a trail of cool, oxygenated water to find the narrow entrance then pausing before entering the dangerous world outside their "pond". Soon enough, gluttony popped us back to the present and we quickly disciplined a few real oinkers! We found one small bay where bonefish were lined up at the narrow entrance. Here, they were dining on tasty morsels flushed out by the falling water. We sat and watched these big fish graze like trout on a mayfly hatch. We never made a cast... apparently even our cavernous gluttony had limits. Soon our shadows began to stretch out and we knew it was time to turn back and begin the long trek back to the boat. We were consoled knowing that we had just experienced something truly special. Perhaps we had seen what Andros was like 100 years ago. We saw no footprints, no outboard motor tracks cut in the turtlegrass, no trash and no signs of humans. It was pristine, untouched and untrodden. My friend and I promised ourselves that we would drag kayaks down with us on some future trip and further explore this amazing creek system. I don't know whether we'll ever get to that, but I do know that two friends will forever remember this glorious day. Postscript: We did return in 2006 with kayaks to further explore this creek system!! Another day... another sensational spring creek. Today, it was simple... I grabbed a spool of 3X and a box of flies. The difficult part was wading the stream's edge without getting your feet tangled in the undulating mats of luxuriant moss or stuck in the sticky marl. The drill was, to paraphrase Teddy Roosevelt, "walk quietly and carry a big fly." And that fly was a hopper... nothing else: no droppers, no tiny mayflies or clumsy nymphs, just big, ugly hoppers. Everything worked including Morrish hoppers, luna negras, chubby hoppers... you get the picture! Throw these big flies into a backcast, snap them into a tight loop and put them unobtrusively in a weed-free slot or next to the bank. It was far better to let a fish betray it presence through a tail or a rise or a subtle swirl. Once you located a fish, you could spend your energy wading quietly into position and then making an accurate cast. If you put these steps together properly, a big head would inhale a big fly. There is nothing better! On our last day, we fished McCoy's Spring Creek. I fished with my old friends Chic Born, Julie Carmichael and Terry Dillon. The day was as hot as the fishing. Smoke from Idaho's forrest fires gave an eerie glow to the day, but did nothing to detract from yet another classic hopper day. With dozens of fished tagged, it was a great way to end our trip! I want to thank Healing Waters Lodge and its sensational staff and guides for taking such good care of our FISH group this year. I think every member of FISH would agree, if you want a classic mix of legendary public "floatable" water and incredible "walk and wade" private water, great meals and lovely accommodations, Healing Waters Lodge is the best choice. If you are interested in learning more, give Angling Destinations (800-211-8530) a call and I'll hook you up with this sensational crew! I spent Day 3 with my old friend John Hoover on the Boulder River. This is a beautiful little stream that meanders through classic Montana ranch lands. We had a sensational trico hatch in the morning. John and I stalked big heads that were loudly chomping the tiny mayflies. At times, it sounded like a bunch of teenagers chewing gum. That afternoon we had some wonderful hopper fishing on an unseasonably warm afternoon. After a wonderful dinner at Healing Waters Lodge with the others from the FISH group, we exchanged the day's fishing report over dessert and made plans for the next day. Soon we retired for a restful night's sleep at this beautiful lodge which got us recharged for the next day's fishing. We were not to be disappointed! The next day I fished with Jim O'Keefe and Bill Kemph on the Circle 3 Ranch. Here, we had what we had come for... big trout on hoppers! We started on this cold fall morning on the main Beaverhead River where we used nymphs and streamers with great success. After the day warmed up and temps climbed headed well into the 80's, we left the Beaverhead to try the spring creek on the ranch. Seemingly innocuous, this small stream meanders through alfalfa fields and is barely visible at times. Often long grasses stretch out from the cut banks to lean over the stream. Casting can be challenging, but this is a perfect home for big trout. With clear cold water and weed banks waving in the subtle current we were fishing a classic Western spring creek. It is technical water requiring long casts, but the reward is big trout. Our largest fish was a 23" brown and an similarly sized rainbow. We also saw much larger fish and had some true heart-stoppers rise to our flies. On Day 2 in SW Montana, we left our comfortable digs at Healing Waters Lodge to fish a private pond in the morning. The pond was simply amazing! It was loaded with scuds and baitfish... and huge 'bows and browns to 30 inches!! We walked the shore sightfishing the big trout with long leaders, sow bug patterns and unweighted wooley buggers. It was just like bonefishing... as much hunting as fishing. I just got back from Montana with my old friends from the FISH (Forum for Indiana Subjects in Health) crew. This was FISH XXI - whew... time flies when you're having fun!! Over the years, FISH has been to Montana, Wyoming, Belize, the Bahamas, Canada just to name a few. This year we repeated a previous year's trip with a visit to SW Montana. This year, we fished the classics like the Madison, the Jefferson, the Big Hole and the Beaverhead, as well as numerous private ranch spring creeks. We had some tricos in the morning, lots of big trout on hoppers in the afternoon, perfect weather, and a great group!